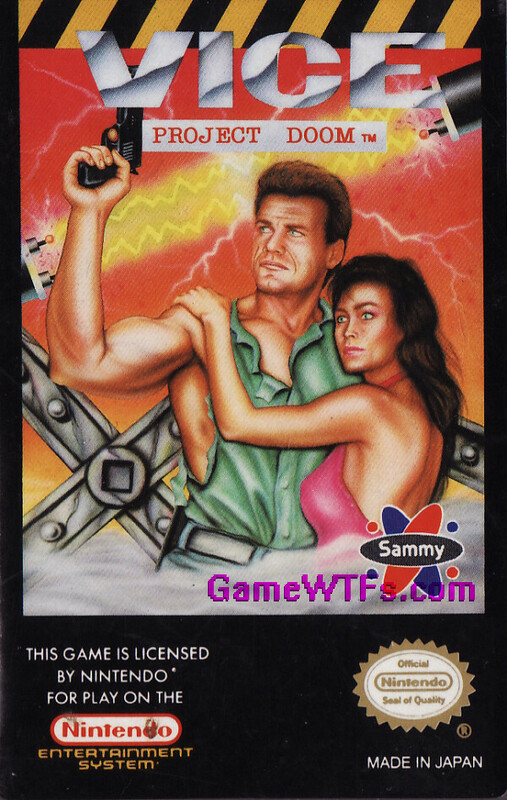 I was looking at Impossible Mission II's cover art the other day, and I realized that the drawing suggested a different story than the game. 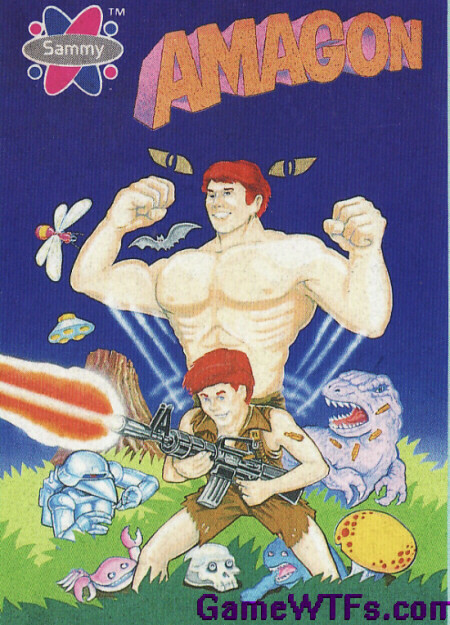 Then I thought, "why not scan in some other NES games whose cover art seems to describe a completely different plot?" Why not, indeed! Uh, I don't have a good answer or narrative device to put after "why not, indeed!" Let's move along. In each case, I'm going to use two game screens to summarize the actual story as we experience it in-game...then we'll move on to the story which the cover art might suggest! Pro Tip: Click the cover art for even BIGGER pictures of the cover art! 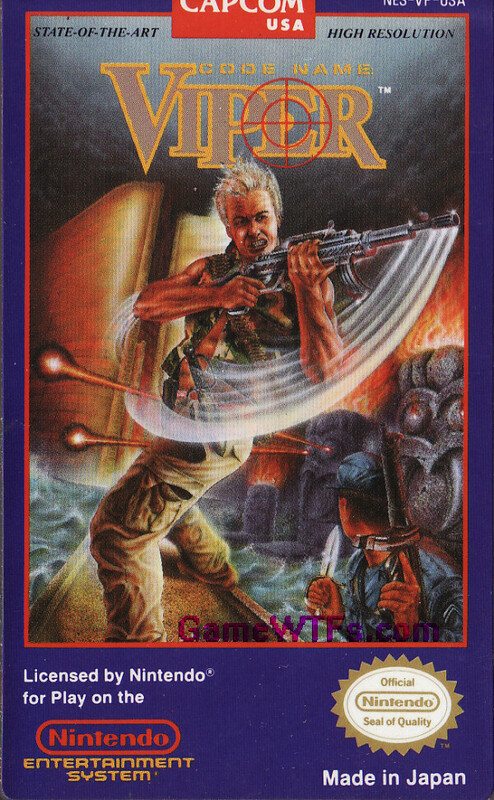 Drug-Bustin' Commando shoots everyone! 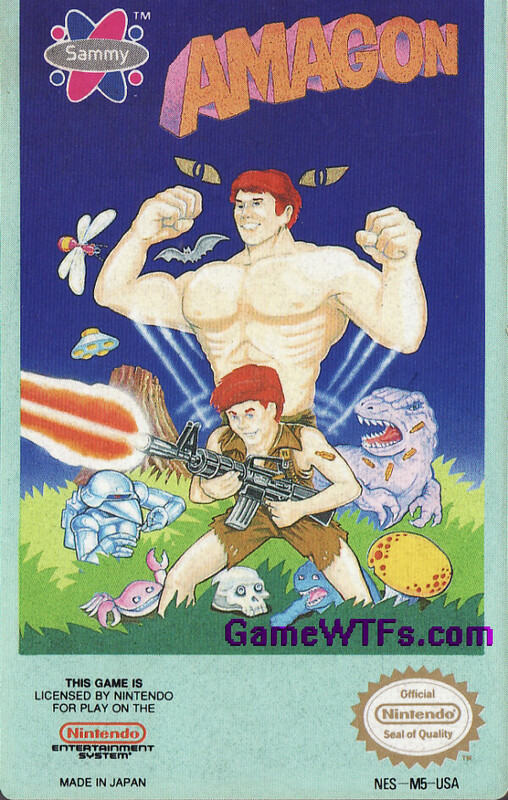 (Though it's impossible to tell if he's wearing pants). Dan "Boffo" Twirlstein is the world's most powerful baton-twirler, and he's just accepted the most dangerous assignment of his carreer: to use his spinning abilities on a machine gun! He was recruited for this top secret mission by Private Ezekiel Thomas -- a time-travelling Union soldier from the American Civil War (seen in the bottom right corner). Private Thomas has traded his Kentucky long-rifle for an AK-47, but nothing will separate him from "Belinda" -- his huntin'/shavin'/toothpickin' knife! Together Ezekiel and "Boffo" will strive to thwart the dreaded Mugaxoi -- a living insectoid version of Easter Island statues, possessed of dangerous pyrokinetic abilities! Can your twirling, machine-gunning and knifing succeed where every other branch of the American military -- past, present and future -- has failed? Only PLAYER 1 (and possibly PLAYER 2) can determine this! Scrawny guy in potato sack fires giant pellets from a tiny stick. Occasionally he "hulks up" and attacks using European Uppercuts (which have minimal range). 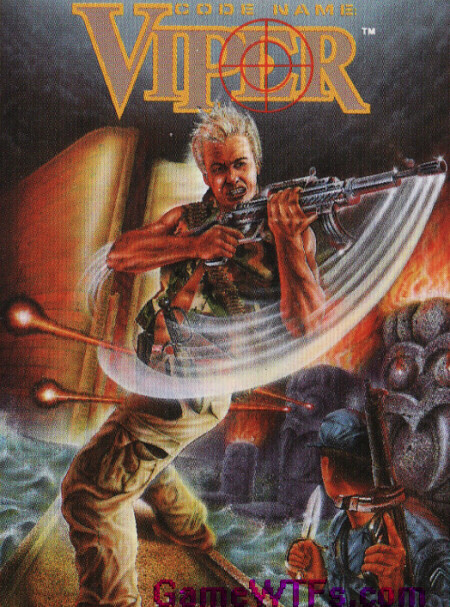 Judging by the cover art, Amagon is the adventures of Tatters Shabbyguy (seen here firing a machine gun wildly off stage right), and Dave the Backpack Genie. As you can tell from the picture, Dave the Backpack Genie emits body odor so powerful that it creates its own "stink waves" -- both visible to the naked eye and capable of interfering with bat's radar and flying saucer's navigation systems. Small swarms of flies (usually drawn to bad smells) are also unable to withstand Dave the Backpack Genie's bodily aroma, but a singular giant purple bee is investigating. Additionally, several other non-airborne entities are visible: in the foreground, crabs, skulls-with-eyes, and a strangely noseless blue bulldog stare directly at Tatters Shabbyguy's posterior. Further back, a Warhammer 40,000 Space Marine and a Tyrannosaurus Rex take in the whole spectacle with suitably expressions of repulsion. Not Discussed (perhaps sequel fodder? ): the red-and-yellow spotted mushroom in the front right corner, and Devil's Tower in the back left*. Vast, shadowy conspiracy yadda yadda yadda...which is unraveled by a lone police man and his thorough detective work laser-whipping of spike-vested mutants, hopping Chinese vampires, and whoever else shows up. 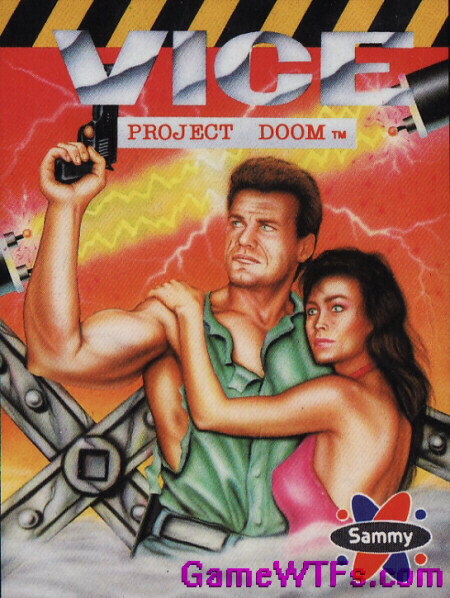 Victor Vice (Martin Kove, The Karate Kid, Project: Shadowchaser, and a "motor rally" episode of McMillan and Wife) has but 24 hours to figure out who's using a construction area's giant electrical turbines to disintegrate his shirt...before his entire torso is exposed to dry ice fog! Meanwhile, Magenta Von Sydebube employs her mascara-emphasized powers of hypnotism to assist Victor, whilst clinging to his dissolving work shirt with her single arm. And what about that mysterious black piece of cardboard covering Victor's back pocket? Did he accidentally get a Denny's menu stuck to his belt when he stopped for lunch? This time it's going to take every scrap of Victor's giant, almost tumescent biscep to pull his police-issue baretta free from the big metal sign hovering above his head -- and he'll have no chance of removing the sign without an allen wrench the size of a Hebrew Nation knockwurst! ...but I think that some of these games would have done better with MY story ideas. Yes, it's an incredibly powerful, almost god-like feeling, to know YOU could have brought greater success to really old video games!